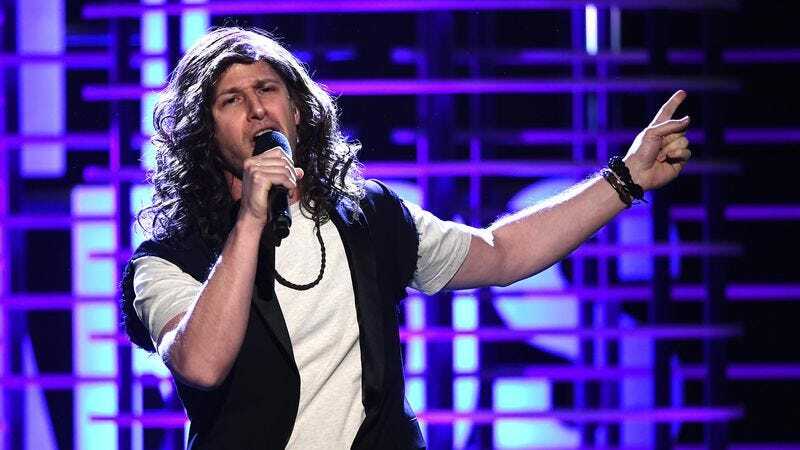 A day before the Academy would accidentally put a picture of someone who is very much not dead in its In Memoriam tribute, Andy Samberg took the stage at the Film Independent Spirit Awards to honor those who haven’t yet bitten the dust with an Eddie Vedder impression. The bit is exactly as weird as it sounds, with Samberg growling about how Milos Forman, Hailee Steinfeld, and Tim Allen are “still alive,” and going on tangents about how he loves the Cubs. When Samberg—who calls Matt Damon ”Mattie D-Bones”—gets around to buddy Fred Armison, the number turns into a riff on Weekend At Bernie’s. Given the Oscars’ faux pas, the whole thing plays in retrospect as a prescient parody of an event that was yet to happen.